Minutes from the bustling hill towns of Tuscany, yet eons away from crowds of tourists, stands a secluded 17th century stone farmhouse. Set amid 800 acres of olive groves, rolling pastures, and sunflower fields, the Fattoria di Vagli (Vagli farm) is part of a growing trend in Italy, combining agriculture and tourism with the peace and tranquility of a countryside stay, all while dining on traditional Italian dishes. 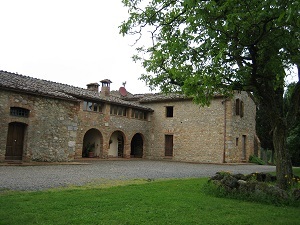 Conveniently located near Sienna and Florence, the farmhouse is a short drive from San Gimignano. This historic village, with its stunning 15-towered medieval skyscraper, was once the home of prominent Tuscans displaying their power and wealth. It is also known for its beautiful frescoes and hand-painted ceramics. But the Vagli farm is a welcome reprieve. The 10 guest rooms, while retaining the original style with exposed stone walls and painted headboards, also provide modern comforts and private baths. The grounds include a pool for lounging and bikes for exploring the countryside and nearby ruins. Wrought-iron tables under shady olive trees and in secluded courtyards provide perfect spots for drinking in the surrounding views, which are filled with sunflowers in the summer months. They’re also perfect spots for drinking a glass of the local Vernaccia wine, which has been in existence for over 700 years. History tells us that this “wine of the Popes” was written about by Dante in Divine Comedy in 1276, and even Michelangelo and Da Vinci enjoyed a glass. 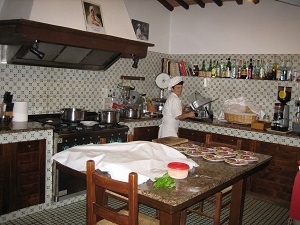 Meanwhile, Mama Emilia, wearing her starched white chef’s hat, lovingly prepares a home-cooked meal in her blue-tiled kitchen, surrounded by pots of simmering sauces and pastas. As the enticing aromas drift back through the soft evening breeze — reviving your spirit and appetite — your travel stress will soon evaporate into the peaceful Tuscan sunset.